Indian Peafowl is national bird of India. It is one of the beautiful birds of India. Particular male Peafowl are best known for the extravagant display of feathers. 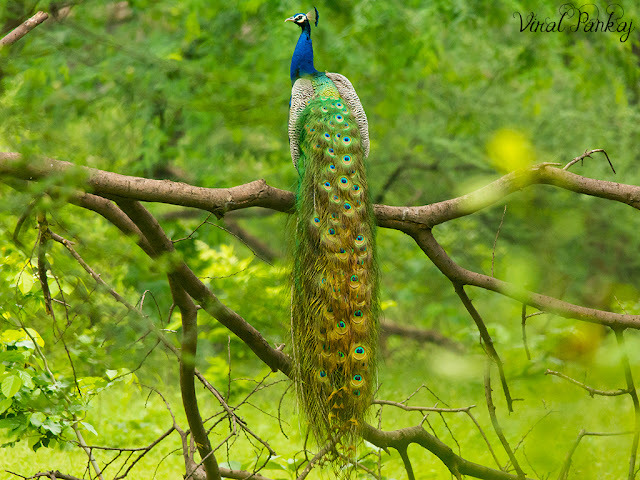 We have Nikon D7100 and 300 mm prime lens so we never get chance to get full frame image of Indian Peafowl. We either get close-up or some part of this bird. We frequently visited Indroda Nature Park situated at Gandhinagar because it is one of the favorite places for my daughter. We went there early morning on working day as on weekend park is usually full of people. When we enter into the park on one side Indian Peafowl male perched on branch and it little far away so it will fully come under my lens.. It was monsoon season so Peafowl produces loud calls and park was covered with beautiful green vegetation. It looks pretty cool and elegant. Finally our one of wish comes true.